The AMD Radeon RX Vega 64 and Radeon RX Vega 56 Graphics cards are out now and hopefully you’ve taken a look at gaming performance in our full review of both those cards. 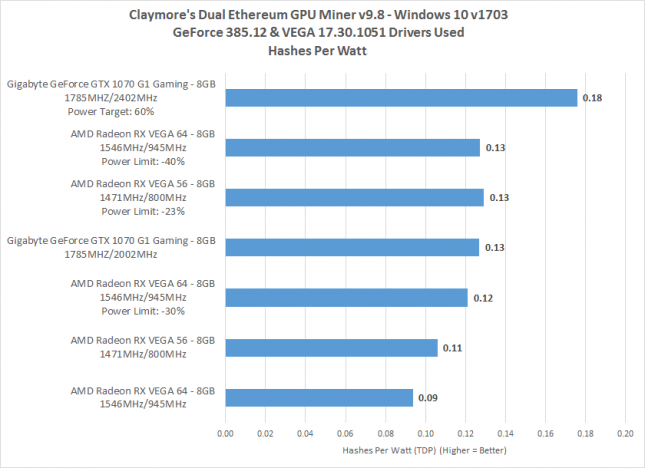 There have been rumors that the AMD Radeon RX Vega 64 is capable of getting hash rates as high as 100 MH/s mining Ethereum, so we also spent come time with Vega 64 and Vega 56 down in the Ether mine to see how they’d perform. 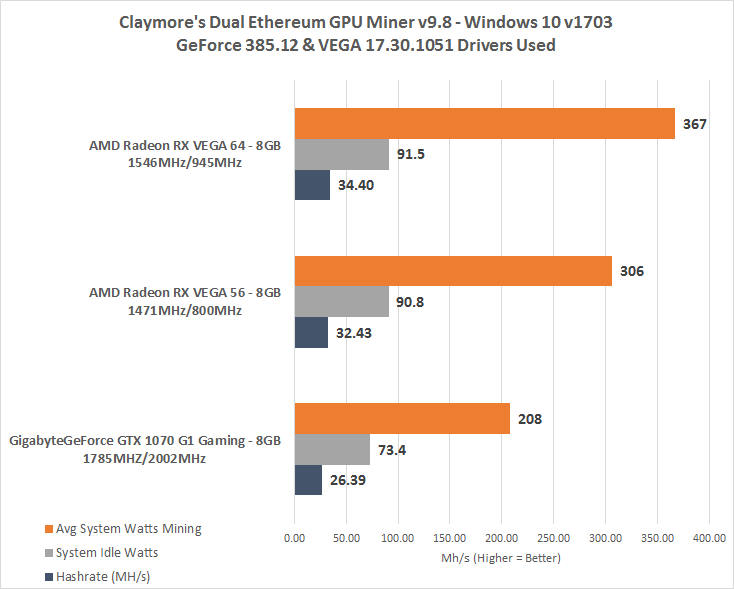 We used Claymore’s Dual Ethereum AMD+NVIDIA GPU Miner v9.8 and tested the two VEGA cards one at a time in the system to see how they did on the current DAG epoch #138. We also tossed in an NVIDIA GeForce GTX 1070 video card from a board partner just for fun as that is one of the most popular mining card that people can buy today with most Radeon RX 570 and 580 cards being out of stock. So, on the current DAG Epoch (#138), difficulty of around 1,700 TH and a block time of ~21.5 seconds this is what we are looking at in stock form with 1 minute average after running for a period of 15 minutes to let the cards warm up. The AMD Radeon VEGA 64 gets 34.4 MH/s with the system pulling 367 Watts at the wall. 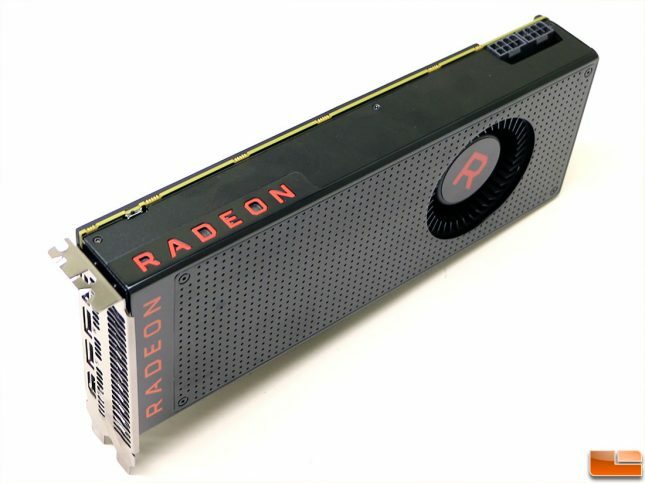 The AMD Radeon RX Vega 56 gets 32.4 MH/s with 306 Watts at the wall. Not bad results, but not close to the rumored 70-100 MH/s performance these cards were said to have. No sane miner uses stock settings, so let’s look at what happens when we overclock the cards and use some power saving settings. The AMD Radeon RX Vega 64 was able to have the power limit lowered to -30% without drastically impacting the hashrate of the card as it was 34.3 MH/s, but our power dropped down to 283 Watts. We dropped it down to -25% and for 33.9 MH/s at 269 Watts and then finally -40% and got 32.6 MH/s at 256 Watts. Lowering the power target really helped the power consumption as going to -30% saves about 84 Watts and that is a ton if you have a mining farm with dozens of cards that is consuming thousands of Watts of power all day for months on end. Overclocking the memory didn’t change performance on either card. This might be a driver issue, but right now this was the best we could get. The AMD Radeon RX Vega 56 we were able to drop down to -25% and we got 247 Watts at the wall, but the hashrate took a dive to 30.1 MH/s. We ended up dialing it in at -23% for a hashrate of 32.40 at 251 Watts. Lastly, the GeForce GTX 1070 was able to be overclocked with EVGA Precision X up to +800 MHz memory. With the extra memory clock speed and we got that card up to 32.17 MH/s! We also did that with the power target lowered to 60%, so the power draw dropped down 183 Watts despite the memory overclock! So, what else can we show you? How about hashes per Watt? The NVIDIA GeForce GTX 1070 that has had the power target lowered offers the best hashrate per Watt and that is critical for your electric bill. In stock form the AMD Radeon RX Vega 64 gets 0.09 MH/s per Watt of power used and we were able to improve that to 0.13 MH/s per Watt on both the Vega 64 and Vega 56. That is where a GeForce GTX 1070 is stock. The AMD Radeon RX VEGA 64 was going to be a hit for ethereum mining, but it looks like performance just isn’t where it was rumored to be. AMD has stated that they are working on a block chain driver that improves the DAG performance for all Polaris and Vega cards that should be out sometime really soon. It will be interesting if the optimizations fix the DAG performance drop that has been coming for months and improves Vega performance. We will know shortly and coverage will be posted on Legit Reviews the day it drops. When we requested more cryptocurrency performance information our contacts at AMD said they were focused on gamers and had nothing to add. We are sure that the mining community will try these cards out and modify the firmware to extract the most performance from VEGA in the coming weeks. This might not be a mining monster that everyone read about for the past few weeks, but it isn’t a turd either. When it comes to pricing the AMD Radeon RX Vega 56 is $399 and the Radeon RX Vega 64 is $499 for the standalone air cooled models. The MSRP on a GeForce GTX 1070 is $379. Chances are you won’t be able to find any of these cards for those prices due to the mining boom, but they are more readily available now than they were a couple months ago. The ASUS GeForce GTX 1070 8GB STRIX will be in stock on August 18th for $449.99 and the Gigabyte AORUS GTX 1070 8GB will be on the same date for $439.99. It will be interesting to see what the AMD Radeon RX Vega cards will be priced on the street later today. 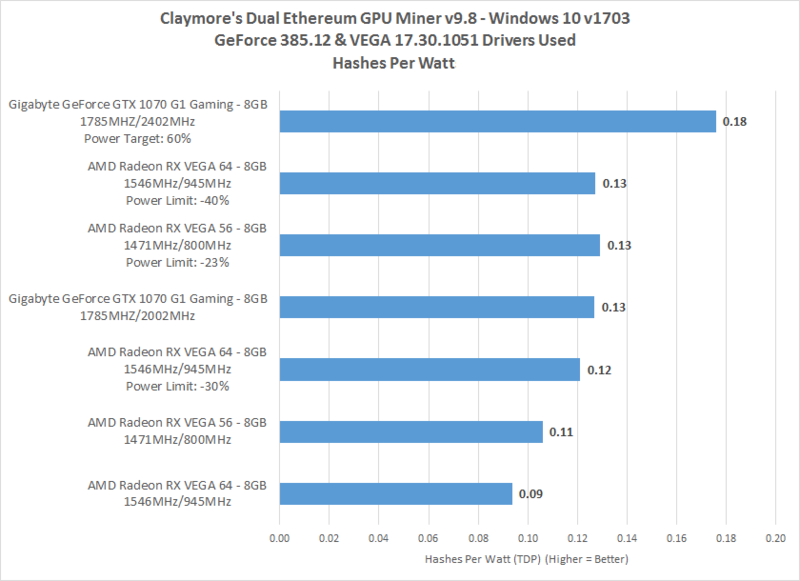 Be sure to take a look at our article from earlier this year if you want to know what the best GPU is for ether mining or to see what hardware we suggest buying to setup a rig! Update 08/14/17 1:30PM CDT: VEGA 56 Overclocked! We have been playing around with overclocking a bit more on the VEGA RX 56 and the performance numbers are a little weird. We are able to overclock the memory from 800MHz up to 950MHz with full stability. Running the memory at 1000MHz causes an instant crash and 975MHz causes random crashes at load, so we stuck with 950MHz. The Vega 56 gets 38 MH/s when we start mining, but down to an average 1 minute speed of 34.17 MH/s after just six minutes of mining. This is a nice bump up from the stock number of 32.43, but we wish it would stay up at 38 MH/s. We were doing this run with the power limit at -23% and when we raised that up to -10% the 1 minute average increased up to 34.1 MH/s. The power jumped from ~252 Watts to over 320 Watts by doing that. We are still investigating and let AMD know of the issue as no matter the power limit performance starts out at 38 MH/s and drops down 3-4 MH/s after a few minutes. We also have been having issues with Wattman going transparent during use, so another growing pain that needs to be worked out on Vega! 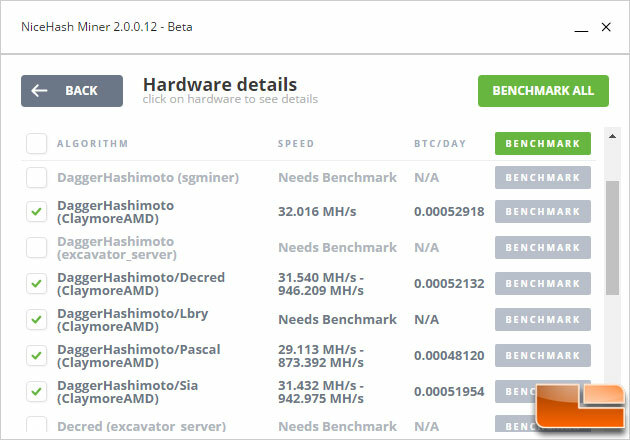 Update 08/15/17 8:00AM CDT: Stock VEGA 56 w/ NiceHash Miner 2.0.0.12 Beta Standard Benchmark! 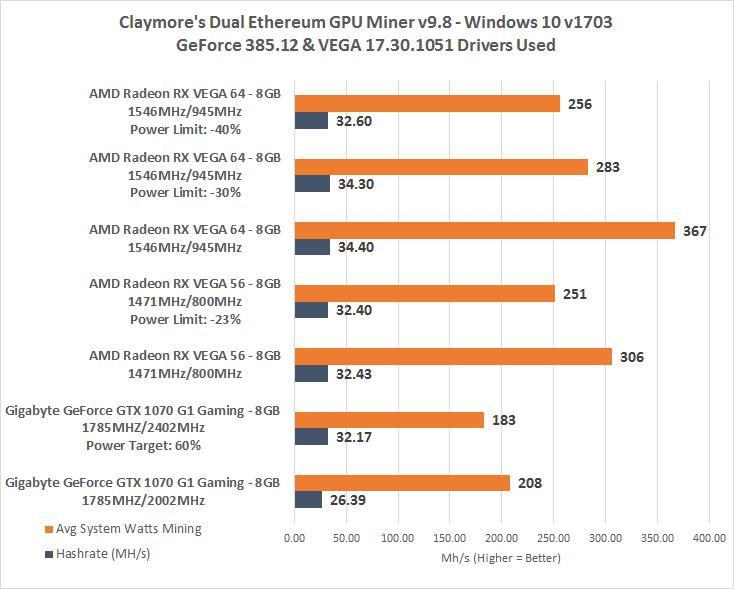 AMD has released a mining optimized driver for block chain workloads this morning and we have tested that driver in our most recent article.